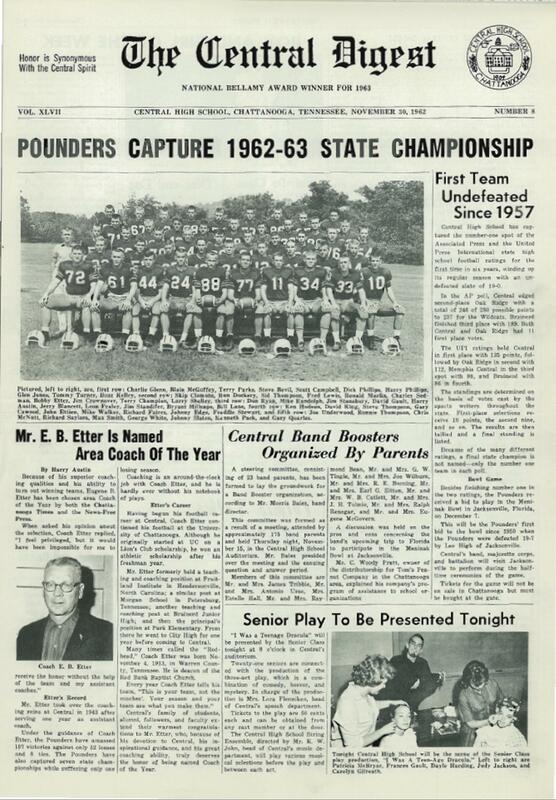 This is the earliest Central football program I’ve located thus far. The program is on a 22 x 16 inch piece of finished paper folded twice, and has team rosters and a double-page picture selection of Central players on the inside. The inside information also indicates the game was played on Frawley Field. WOW! 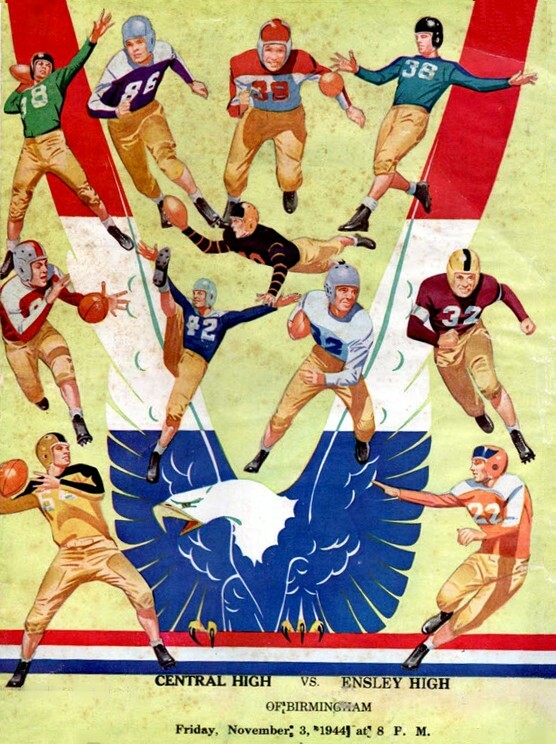 The oldest Football Program I have seen or ever heard. Did you put it on the History site? 1944 I would have been 4 years old. 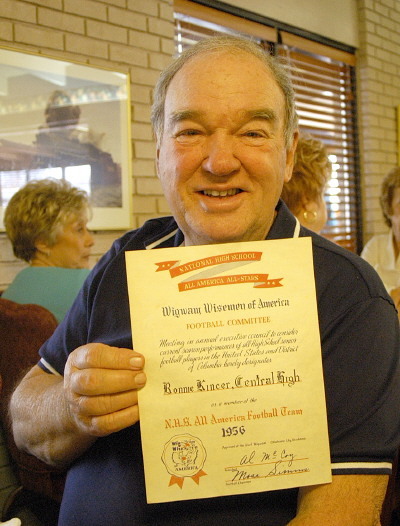 I am not sure how old I was when I started going to the football practices and games at Frawley Field. Frawley field became my play ground since I only lived one block from there on McCallie Ave. I could go out my back door down the alley to N. Lyerly St. to Frawley. I can still see the main gate on McCallie where people paid and came to the games. There was also a gate on N. Lyerly but it was used for the teams coming to play. Had a lot of fun times on that field. In those days it became a tradition for the Central band to march from school down McCallie to the field. Everyone would gather to watch and listen as they played and marched. Click on the link in the header to check it out. By Charlie Sedman: Raymond Earl Moss Jr. was killed in a small plane crash on October 7, 1976, two days shy of his 40th birthday. 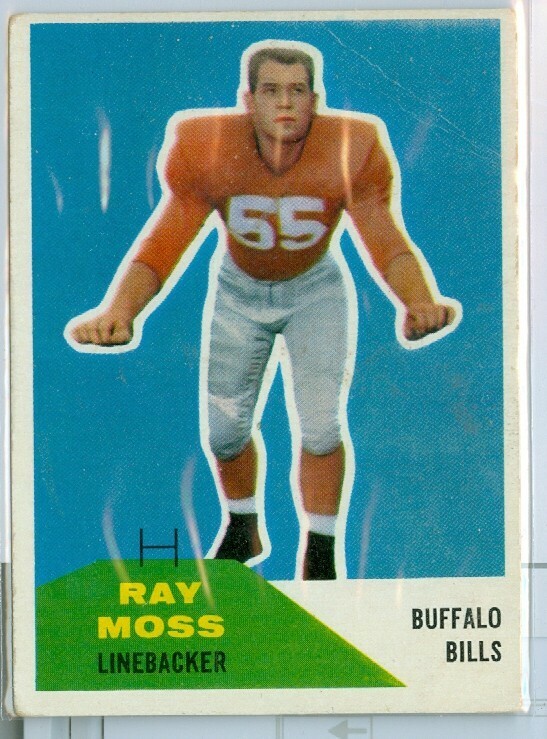 His son, Ray (Trey) Moss III was probably a year old when he died. Ray’s father was a major league pitcher for the Brooklyn Robins (later to become the Dodgers) from 1926-30 and Boston Braves (1931). His dad lived to be 96 years old, passing in 1998, and his mother lived to be 101, passing in 2007. Ray, his father, and brother-in-law started a very successful chain of convenience stores – The Golden Gallon – in 1959 as an outgrowth of the family dairy, and Ray Jr. was returning from a trip for that business when his private plane crashed near Dalton, GA. 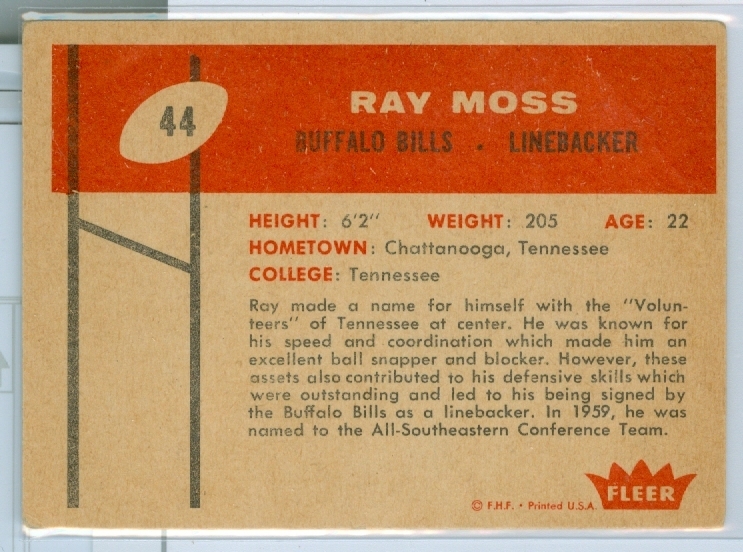 If you saw the recent hit by Jadeveon Clowney for South Carolina in the Outback Bowl that probably allowed his team to win, Ray Moss Jr. made a similar hit on a punt return against Baylor Prep in 1954, with his team trailing 7-6, and picked up the ball, returning it for a touchdown and an eventual 18-7 win; in effect clinching Central’s fourth straight state football championship, and him a scholarship to UT. I, as an 8-year old, saw and heard it, and it was the most electrifying moment I ever witnessed at a live sporting event. This answers the question, “Which came first, Central or the football team? And the answer is the school, but only by a few days. The football team did precede classes in the new building by nearly three months. I’ll have a few followup notes under the 101 Years ago heading, leading to Central’s first two football games in October 1907 against Baylor and City. This answers the question, “Which came first, Central or the football team? And the answer is the school, but only by a few days. The football team did precede classes in the new building by nearly three months. I’ll have a few followup notes under the 101 Years ago heading, leading to Central’s first two football games in October 1907 against Baylor and City. 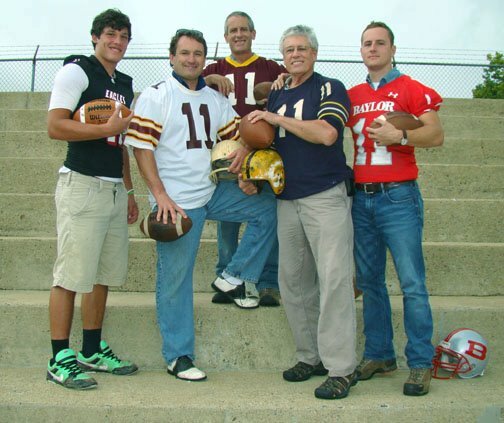 Central’s football teams have faced many great players and coaches over the years. One such encounter occurred in the Fall of 1919. New head coach Rusty Cornelius had to cope with losses of star players who were “recruited” along with Coach Rike to Baylor, and an inexperienced team that had played only three games the previous year with no head coach. Cornelius hastily cobbled together a schedule of seven games with whoever was available. 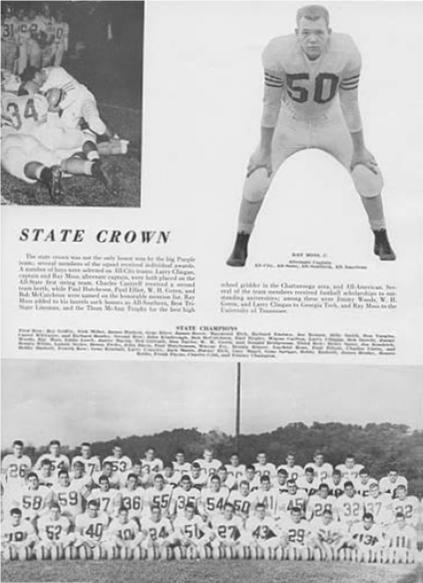 Remarkably, with great leadership from a junior quarterback named Dean Petersen, Cornelius forged a 5-1-1 record, with five shutout wins, the only blemishes being a 0-0 tie with Rike’s all-star Baylor team and a decisive 33-6 thumping by an obscure military school, Fitzgerald-Clarke Academy of Tullahoma, Tennessee. The 33 points by Fitzgerald-Clarke were the only points allowed by Central that season. So what was Fitzgerald-Clarke Military Academy? Turns out it was one of a handful of college prep schools used by Vanderbilt and other colleges to help promising athletes pass college entrance exams. 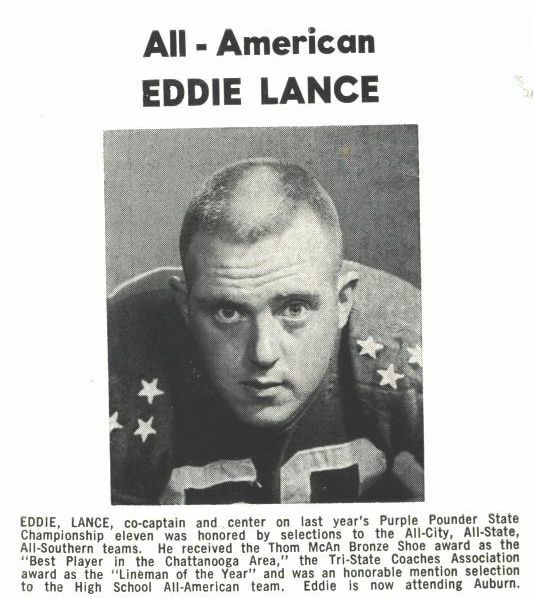 In this particular year, 1919, Fitzgerald-Clarke had, amongst others, a 6-1, 210 lb lineman named Lynn Bomar from Texas, who would later become an All-American at Vanderbilt and play professional football for the New York Giants. Ironically, 1919-20 was Fitzgerald-Clarke’s last year as an institution, for the school barracks burned down just after the football season ended, then the school burned down and never reopened. But perhaps more noteworthy was their young football coach who, out of a job after the school calamities, followed the pipeline to Vanderbilt as an assistant coach. By 1923, at age 31, he was head coach at Alabama, then by 1930 head coach at Duke, where he would remain until 1950. Overall he won three National Championships at Alabama in seven years and had an unprecedented winning (110-36-7) record at Duke. Plus a 1-0 career record against Central. His name – William Wallace Wade. 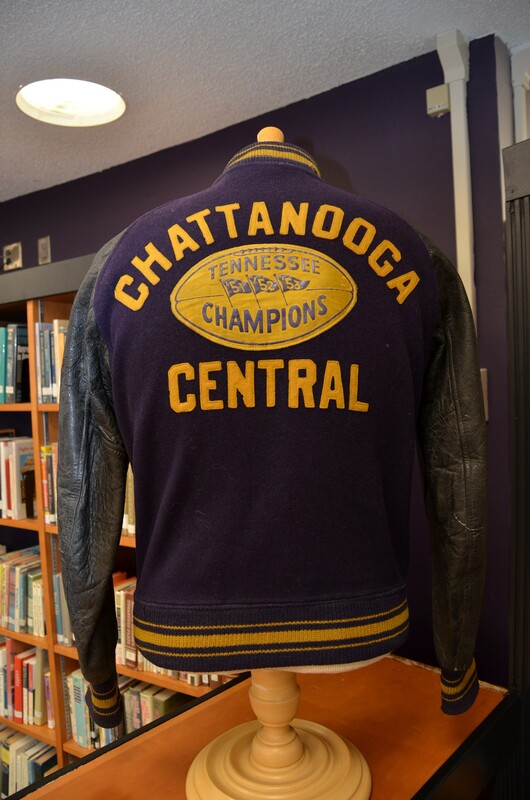 On October 15, 1937 Central made a return trip to Cleveland where two years before they had so decisively dominated the Bradley County football team, that Chattanooga Times reporter Springer Gibson anointed them the “Purple Pounders” for the first time. On this evening, Central again ruled the first half in front of a disgruntled group of Bradley fans. 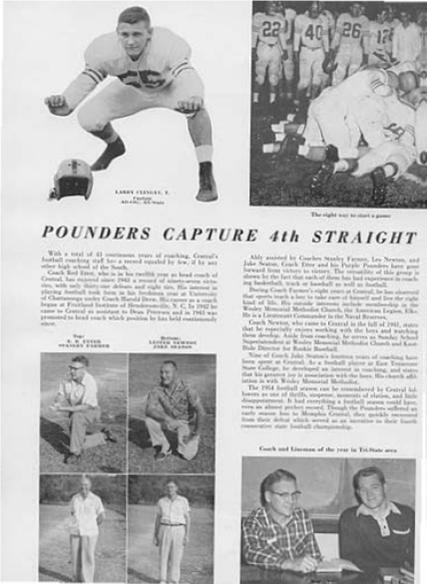 During the opening kickoff of the second half, the Pounder’s football Captain, Dexter Hodges, was running free on an apparent 80-yard touchdown return, when he was rudely upended by a shoestring tackle via one Charles Ledford on the 10 yard line. On the next play Central would fumble near the goal line, and Bradley would temporarily hold, eventually losing 21-0; so Ledford’s solid hit would not change the outcome of the game, other than shaving 6 or 7 points off Central’s winning margin. Hodges would later remark that Ledford’s tackle was the hardest hit of the game against Central. There would not be a story here, except that the 5 ft 8 inch, 130 pound tackler was a 21 year old taxi driver, who, taking the dare of some buddies at halftime, resolved to tackle the next Central runner approaching Bradley’s goal. And the opening kickoff breakdown by Bradley’s coverage team gave him ample opportunity to show his talent. As Hodges looked back to see if any Bradley player were in close pursuit (they weren’t), he didn’t see the fan come out of the stands and lunge headfirst at his ankles, ending his race down the sidelines. The referees didn’t know exactly how to rule, and curiously decided (as home refs are wont to do) to penalize Bradley half the distance to the goal, rather than award the visitors a touchdown that was the certain outcome, had Ledford not inserted himself into the fray. The Chattanooga Times gave this play the game highlight, as it was the most newsworthy action that occurred that evening in Cleveland. Some 16+ years hence at the Cotton Bowl, an Alabama player named Tommy Lewis came off the bench to tackle Rice star Dickie Moegle , abruptly ending what would have been a 95 yard touchdown from scrimmage. In that venue, the referees rightly awarded Rice a touchdown in a 28-6 win over ‘Bama. 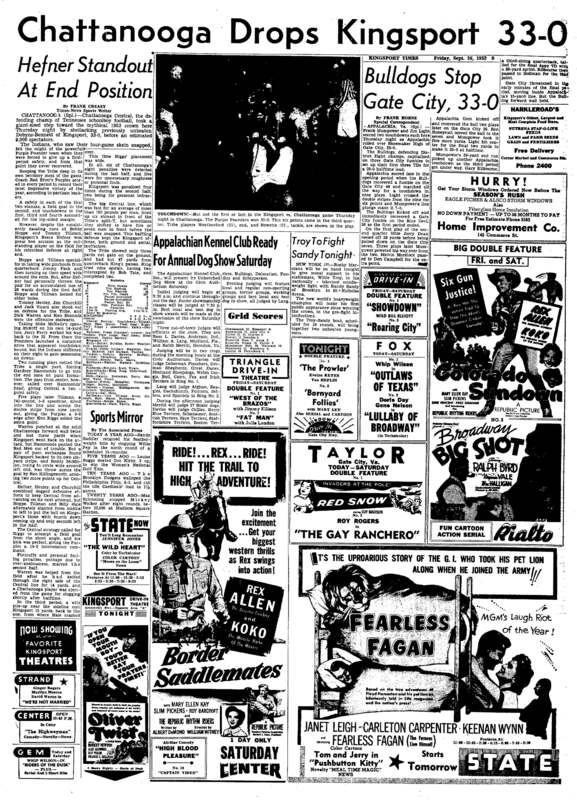 The following day, Wirt Gammon of the Times favorably compared the 1937 Bradley-Central and 1954 Cotton Bowl fiascoes in his “Just Between Us Fans” column. 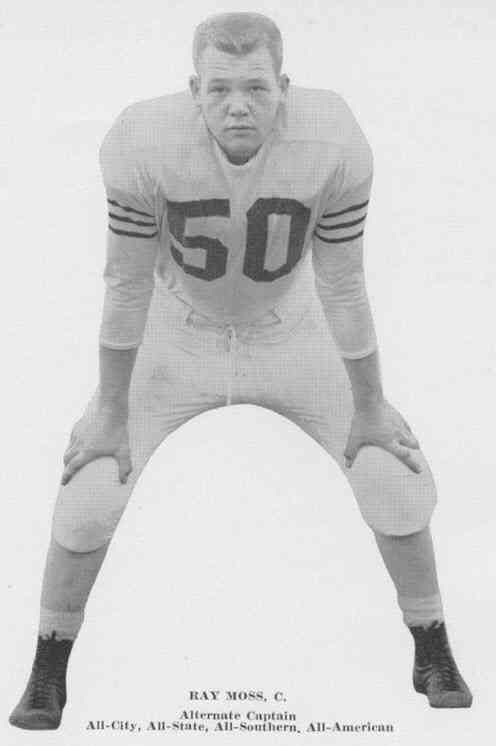 Upon reading Gammon’s essay, Mr. Ledford, still a resident of Cleveland, made a hasty phone call to Gammon, in which he protested the comparison, asserting that (1) he was a civilian in street clothes while Lewis was a highly skilled athlete in full pads, and (2) Lewis did not prevent the opposing team from scoring, while his own effort had indeed prevented Central from scoring. Most of the above information was recently e-mailed to me by Charles Ledford, Jr. of Hiram, GA, who had read my Central Football history essays at the Chattanoogan.com and wanted to know if I had any details of the incident (I didn’t, other than that an unnamed Bradley fan had indeed tackled Mr. Hodge to start the second half). This was apparently a favorite family story of the Ledford’s for many years. Charles E. Ledford Sr. went on to serve in the Army during WWII, and was on Iwo Jima when the famous flag-raising occurred on Mt. Suribachi February 23, 1945. Ledford returned to Cleveland after the war and raised a family, serving as a firefighter. 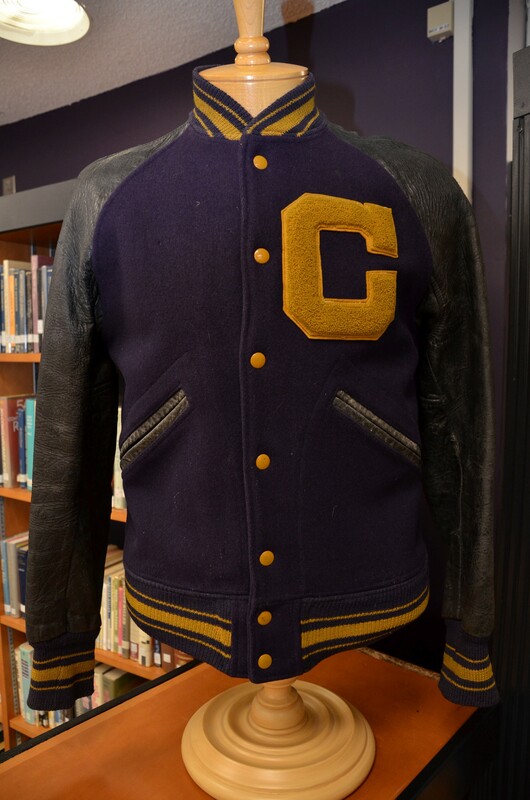 His youngest son played for Bradley County against Central in 1967 in a game won by Central in Cleveland 26-7, but was marred by the collapse and eventual death of Central’s star end Mike Perkins.